We’ve had great 2014 and are so happy to have all of you along for the ride. The holidays have flown by and we suddenly find ourselves on the cusp of a new year. Time flies, doesn’t it? We’ve had great 2014 and are so happy to have all of you along for the ride. If you were a Soil Building Program client this year, new or old, welcome aboard! Consistent and regular organic management of your soil is the best way to keep your landscape thriving and reduce your family’s chemical exposure. 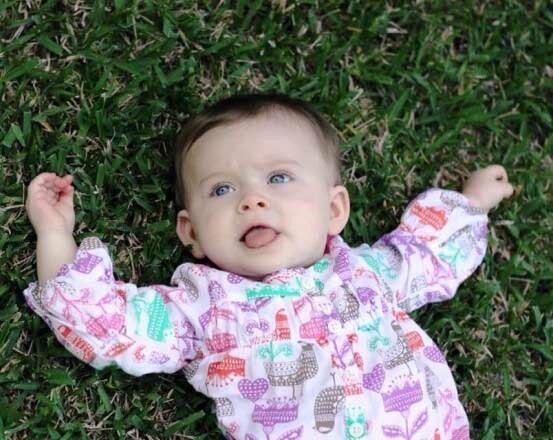 Stacey & Jason Beatey let their adorable daughter lay around on their organic lawn. When making healthy choices, it can be easy to forget your lawn and landscape. By fertilizing and treating your lawn and garden with organic materials, you’ll reduce chemicals in our drinking water, keep your lawn “barefoot approved” for kids and pets and lower the chemical impact on your environment. Think going organic in your landscape will just end up costing you more money? We’d like to dispel that myth and show you that it is an economical, easy way to maintain a gorgeous green lawn and landscape. Building a healthy, organically maintained soil will not only help to keep your plants healthier, but also save you water and time. Looking to go green in the new year? Recycle your fresh Christmas tree. Our friends at Preservation Tree just posted some great info on where you can recycle trees. Choose organic and Eco-friendly home cleaners, fruits, vegetables and meats. Compost, recycle and reduce your kitchen and landscape waste. Use organic fertilizers and pest treatments in your lawn & landscape. Reduce water use in your landscape by building healthy soil and choosing water-wise plants. Add a rain barrel to your home’s downspouts. We hope you’ll keep our blog bookmarked in 2015 and pass it on to family, friends and neighbors. We’re here to help you learn more about creating and maintaining a healthy home and landscape. Here’s to a wonderful and safe New Year everyone!